Agrodolce is an Italian sweet and sour dressing. Vinegar and sugar usually form its base, which is then flavoured with herbs and garlic. This version uses lots of fresh mint and parsley to provide a seasonal dressing for griddled or barbecued aubergines and courgettes, suitable for vegetarians. 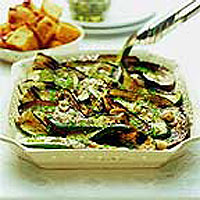 Trim the ends of the aubergines and courgettes then cut them into 1cm thick slices lengthways. Brush the slices lightly on both sides with ½ tbsp olive oil and season. Cook the aubergine and courgette slices, for 6-8 minutes, on a preheated griddle pan or barbecue turning once until they are just tender and golden brown. Transfer the griddled vegetables to a serving platter, overlapping the slices. Heat the remaining olive oil in a small pan, add the garlic and fry gently until tinged a light brown. Add the sugar, vinegar and seasoning, bring to the boil, stirring to dissolve the sugar, then pour the dressing over the vegetables. Scatter the mint and parsley over and serve with a basket of warm focaccia bread and perhaps some Italian olives and slices of Parma ham. Try grilled red and yellow peppers or cherry tomatoes on the vine. Sprinkle with a handful of toasted pine nuts when you add the herbs.